In chilled small bowl, beat whipping cream, 1 tablespoon brown sugar and 1 teaspoon espresso coffee with electric mixer on high speed until stiff peaks form. Cover and refrigerate until serving time. Mix milk, cocoa, 1/3 cup brown sugar and 2 tablespoons espresso coffee in 3-quart saucepan. Heat over medium heat, stirring occasionally, just to simmering (do not boil). Stir in chocolate until melted. Pour mixture into cups or mugs. Top each with whipped cream. Garnish with cinnamon sticks for stirring. Pour hot mixture into slow cooker set on low, and add 2 cinnamon sticks. Cover and keep warm up to 8 hours. 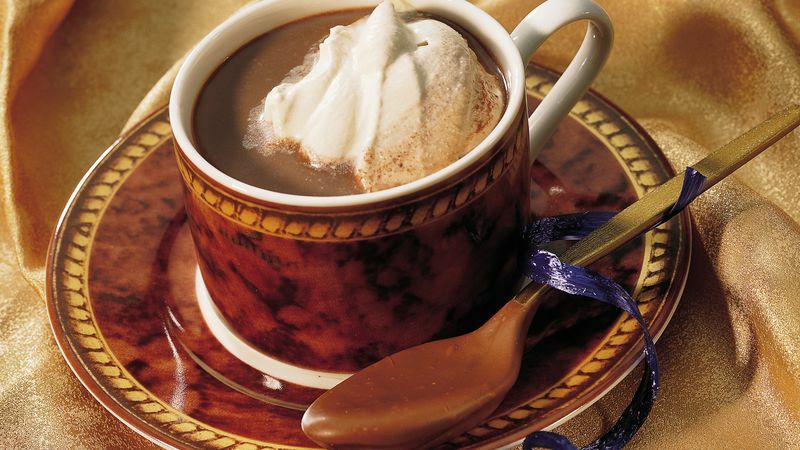 Garnish the cocoa with shaved chocolate, and chocolate-covered spoons. Look for the spoons at gourmet shops, or make your own by dipping plastic spoons into melted candy coating and placing on waxed paper until firm.